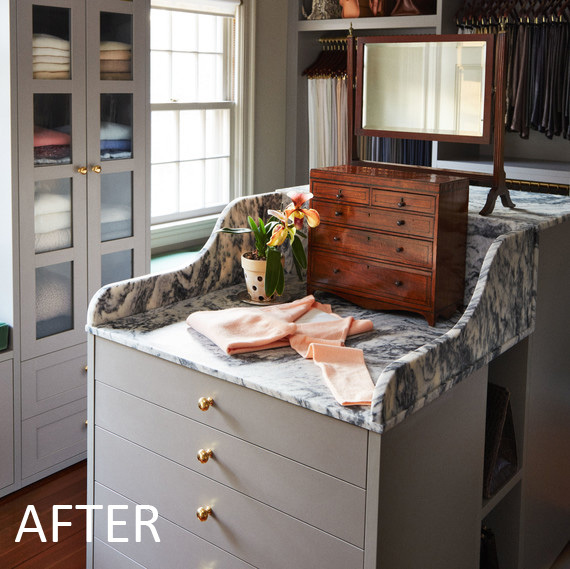 Last fall, Martha converted a small, unused bedroom at her home in Bedford, New York, into a fully-equipped walk-in closet. She employed the services of California Closets with design consultant Chris Reynolds. 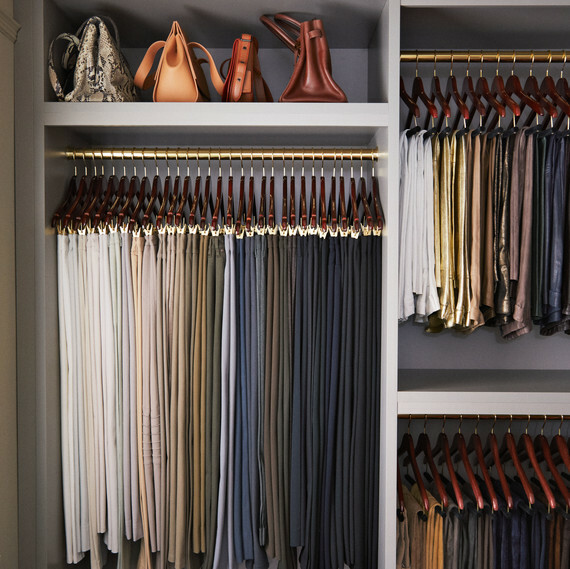 The finished closet is showcased in the April issue of Martha Stewart Living magazine, but you can see a sneak-peek here! 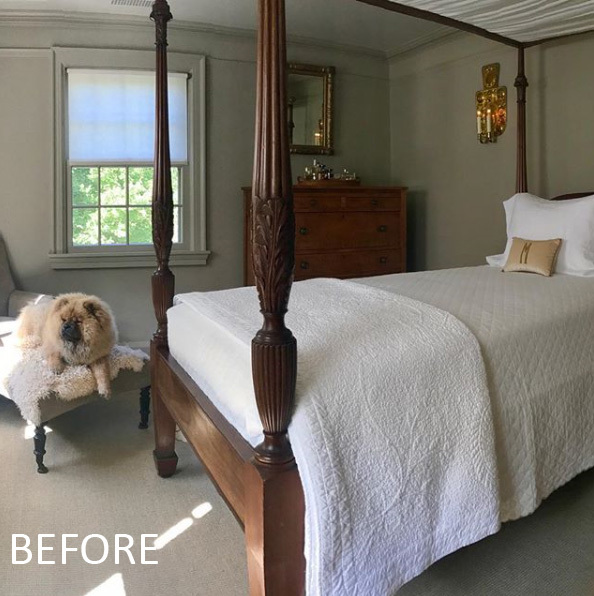 This was the bedroom before the conversion, shown in a photograph taken by Martha and posted on Instagram last October. The room was rarely used and Martha knew the space would be ideal for a walk-in closet. In her caption, Martha wrote: "I have lived with just a couple small closets in my 1925 farmhouse. With TV and public appearances and now my new fashion business with QVC I now have many more clothes and desperately need more space in which to keep them." Prior to the renovation, Martha had to go from room to room to access all of her clothing. Now it is all stored in one place. The transformation, as you can see, is quite dramatic. All of the components, however, are modular, meaning none of the room's architecture was altered; the space could easily be converted back into a bedroom if ever necessary. A two-sided bureau now sits in the center of the room with marble tops similar to the kind used on her pastry countertops. Between the two bureaus are storage nooks for purses and bags. The window shown in the top photograph was covered by one of the closet fixtures, as shown in the plan, above. However, the window remains intact behind the closet wall. 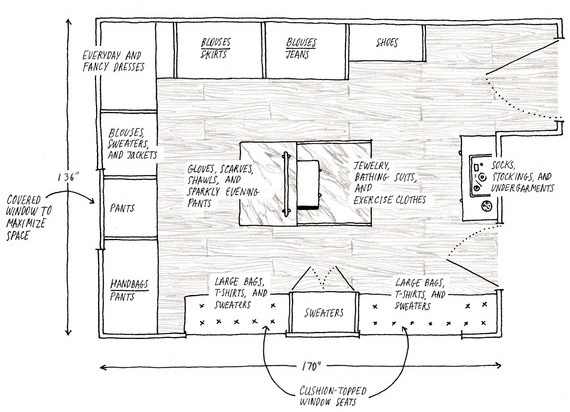 The plan also shows a very careful delineation of space with designated sections to hang shirts and blouses, a spot for shoes, a spot for dresses, pants, sweaters, etc. Two window seats were installed with storage underneath for large tote bags, t-shirts and bulky sweaters. The windows are covered with sheer solar shades which keep out damaging UV rays. 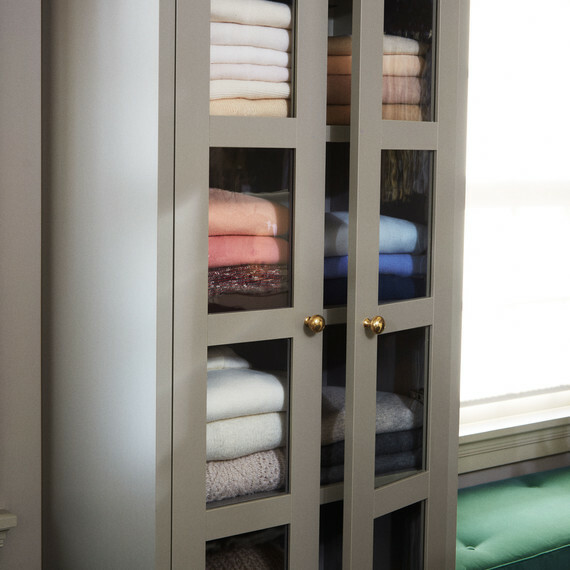 A tall cabinet with restoration-glass doors proffers Martha's sweaters. Martha's clothes are arranged by item and colour. She uses sturdy wooden hangers, which match her floors, for blouses, and thicker ones for jackets. For pants, she uses two types: some with a velvet-covered bar to fold delicate bottoms over and others with brass clips for sturdier pants. A berth above provides a space for more bags and purses. 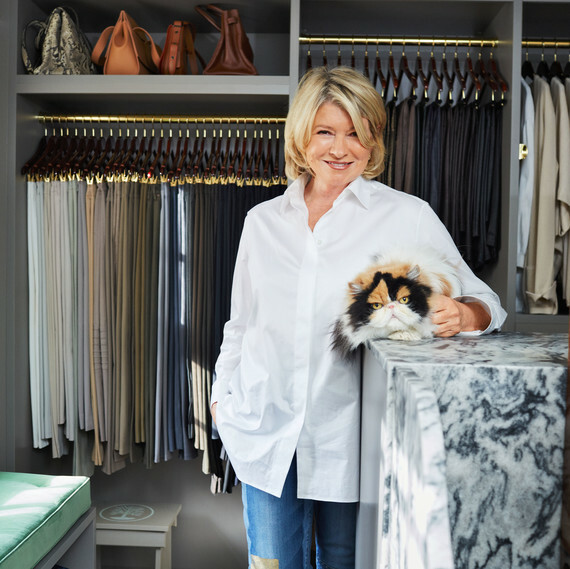 Martha's shoes are arranged on specially designed shelves: Martha commissioned boards that were thicker than one inch (the standard is three-quarter-inch) to add a more bespoke feel. (When Martha finds a style of shoe she likes, she often buys it in multiple colours). Martha says she loves her new closet - everything is easily accesible in one location! (I also love the small stool in the corner emblazoned with the sycamore logo - the Cantitoe Corners insignia). All photographs are by Marcus Nilsson for Martha Stewart Living. To see more photographs and read the full article by Melissa Ozawa, click here. The article also contains links to many sources.